You won’t be able to put them down. These delicious mint chocolate cups taste like a peppermint patty—only without inflammatory processed sugar and mysterious food additives. Instead, coconut oil and coconut butter offer lots of healthy fats to keep skin hydrated. This recipe calls for the use of coconut butter and coconut oil. Unsure what the difference is? Coconut oil is extracted from the coconut, while coconut butter includes the meat of the actual coconut fruit. Nutritionally speaking, coconut oil is entirely made of fat while coconut butter has a little bit of dietary fiber from the meat. Coconut butter also includes some protein, potassium, magnesium, and iron. This recipe also uses lots of cocoa powder, which is full of iron, magnesium, and zinc for optimum metabolism and cell renewal. 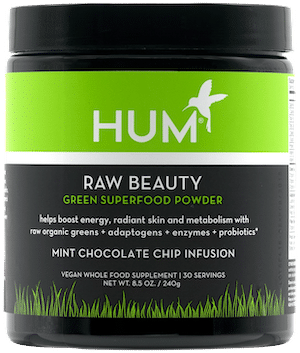 Last but not least, a scoop of our Raw Beauty Green Superfood Powder adds hormone-balancing adaptogens, gut-healthy probiotics, and de-bloating digestive enzymes. Combine melted coconut oil, maple syrup, cocoa powder and Raw Beauty in a bowl. Stir until smooth. Pour 1/2 of mixture into cup molds and refrigerate for 30 minutes. In a separate bowl, mix coconut butter and peppermint extract until thoroughly incorporated. Next, add the coconut butter mixture to the refrigerated cups. Finally, top with the rest of the chocolate mixture and refrigerate for another 30 minutes.